Sacramento, California. March 24, 2015. 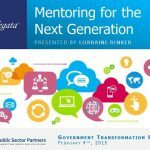 Delegata’s Lorraine Rinker, Senior Principal, recently presented “Mentoring for the Next Generation” at Public Sector Partner’s Government Transformation Forum on February 4, 2015. During the session, Lorraine moderated a lively discussion with California State Agency mentors and mentees about their experience with the mentoring process. Mentor Liana Bailey-Crimmins, CIO at CalPERS, and Mentee Joshua Pocus, Associate Information Systems Analyst at CalPERS shared their experiences with an Informal Mentoring Program, while Mentor Cathy Cleek, CIO at the Franchise Tax Board (FTB), and Mentee Marian McKenna, Bureau Director of National Audit Business Bureau at FTB shared their experiences with a Formal Mentoring Program. As a leader in Organization Transformation, Delegata is committed to supporting successful government transformation through our Organization Transformation Center of Excellence and our practice of InSourcing.